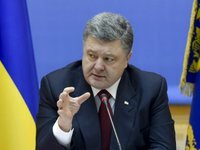 Ukrainian President Petro Poroshenko has called the World Football Championship that will take place this summer in Russia "a pure instrument of propaganda," saying each country must decide its level of participation in the event. The comments came in an interview appearing in the Focus magazine, a scanned copy of which Ukraine's Ambassador to Germany Andriy Melnyk posted to his Twitter page. "The championship has nothing to do with sport, just geopolitics. Everyone must decide whether to go there or not," the president said, adding that he expects the United States and European Union to closely cooperate on sanctions against Russia and the creation of a United Nations peacekeeping force for deployment to Donbas.